Have you ever wondered why the tax law is so complicated? Many have proposed the idea of a simple tax law – one that gets rid of exemptions, deductions, and loopholes. One so simple that you could easily file your taxes on a postcard. The complication of the system favors those with wealth and until the law is simplified, you’ll continue to see wealthy individuals paying a lower effective tax rate than the majority of citizens earning far less. For example, Warren Buffett disclosed in 2015 that he had an Adjusted Gross Income (AGI) of $11,563,931, and his federal income tax for the year was $1,845,557, which is equal to an effective tax rate of 16%. To give perspective, a household earning $160,000 would have a federal income tax of $26,278, which is an effective tax rate of 16.42%. Like-Kind Exchanges, the Step-Up in Basis rule, and Depreciation schedules are just a few examples of tax laws that are helpful to those that understand them, but rarely beneficial to the average taxpayer. If you invest in property, you’re able to do like-kind exchanges, which allow you to defer paying capital gains on the growth of private equity, as well as income taxes on recaptured depreciation. This gives you the ability to withdraw up to 80% or more of your equity in the form of a loan during retirement rather than sell the property and pay taxes on the realized gain. At your death, the loan is cleared, and your heirs receive a step-up in basis, which means they can sell the property and only pay capital gains tax on the difference between the fair market value of the property on the day of death and the sale price. This allows you and your heirs to avoid the capital gains tax and income tax on recaptured depreciation, as it relates to a significant portion of your wealth. READ MORE: WHAT IS FUNDAMENTAL WEIGHTED INDEXING? Personally, accelerated depreciation schedules have allowed me to receive significant passive income from real estate in years while still showing a loss on my K-1. These are just a few examples, but there are many. Until the tax law is dramatically simplified and exemptions, exclusions, deductions, etc. are eliminated, the common saying that the CEO pays a lower effective tax rate than their secretary will continue to be true. I’m not against taking advantage of what the current structure permits; however, be ethical and always follow the intent of the law. I believe the tax system should provide the tax revenue it was intended to create, which should be no more than what is required for the government to operate. The highest federal tax rate, if married filing jointly, is 37% on income in excess of $600,001. If individuals like Warren Buffett are paying an effective tax rate of 16% instead of experiencing the top tax rate of 37% on a large segment of their earnings because of how the income is derived or classified in our tax system, then it creates more pressure on the system to raise taxes for all. Rather than dive into the details of how this applies to the masses, the various rules, etc., let’s focus on how this impacts the segment of people our firm works with: physicians and dentists. Section 199A is available to Individual owners of sole proprietorships, rental properties, S Corporations, or partnerships, and an S Corporation, partnership or trust that owns an interest in a pass-through entity. If you earn only W-2 income as an employee, this feature of the new tax law will not benefit you. It sounds confusing, but luckily the W-2 and qualified property-based limitations do not apply when the taxpayer claiming the deduction has taxable income for the year of less than $315,000 (if married filing jointly, $157,500 for all other taxpayers). This rule only applies for those above this threshold. The W-2 limitations are phased in over the next $100,000 of taxable income (if married filing jointly; $50,000 for all other taxpayers). If taxable income reaches $415,000 for a married taxpayer filing jointly ($207,500 for all other taxpayers), the W-2 limitations apply in full. 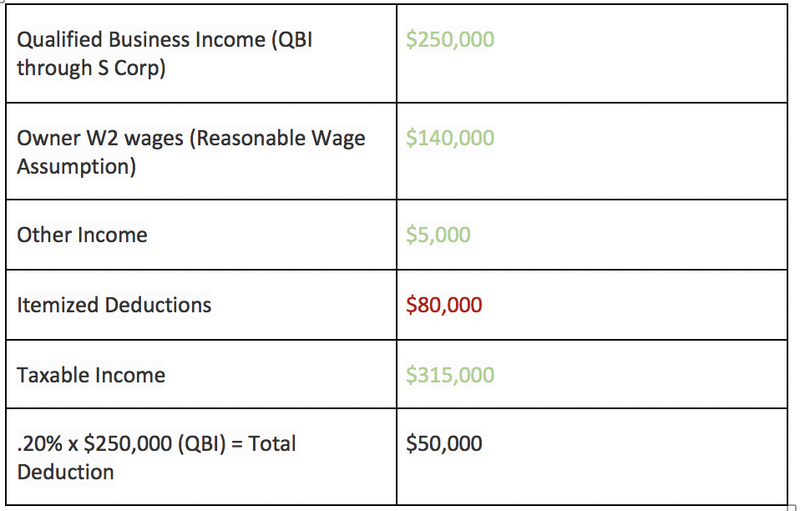 Now, you may use the W-2 wage limitation calculation for other non-service businesses you have as investments or side gigs, but the deduction would not be calculated using qualified business income you earned as a physician or dentists if you exceed the income threshold. Similar to the way the W-2 wage limitation does not apply to a physician or dentists earning less than the income threshold, the same is true for any specified service business. The prohibition on claiming the Section 199A deduction against income earned in a specified service business does not apply if the taxpayer claiming the deduction has taxable income of less than $315,000 (if married filing jointly; $157,500 for all other taxpayers). Well, notice I didn’t say Adjusted Gross Income or Gross Income, I said Taxable income. Calculating the benefit of the pass-through deduction is fairly simple if you are below the applicable threshold for taxable income. In this situation, you avoid the wage-property limitation factor and the specified service business label doesn’t matter. The taxable income is calculated after a variety of deductions such as property taxes (up to $10,000), qualified mortgage interest, charitable giving, Qualified Retirement Plan contributions, and other itemized deductions, so you may surprise yourself and be below the required threshold. If the entity owns property, you have other businesses, have employees, an income-earning spouse, then the calculation can get more complicated. This is an over-simplified, high-level view, of how this deduction would apply to physicians and dentists with a taxable income below the threshold of where the phase out begins. The limitations and other calculations become a factor if taxable income goes above those marks. However, many of the physicians we meet, have a taxable income below $315,000 after plan contributions and itemized deductions, which is why I believe this is relevant and worth knowing. I simply want to make you aware of the recent change to the tax code as the deduction will be very beneficial for those that qualify, so pay close attention to itemized deductions and make sure taxable income hits below the necessary threshold before the end of the year.